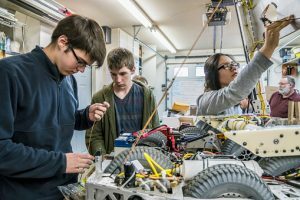 If we told you that high school students can earn high school credits while taking hands-on skill training that prepares them for high-wage, high-demand careers, would you say that sounds too good to be true? It’s true, it happens in every state, and it’s called “career and technical education,” or CTE. When students complete programs and their high school education, they may go on to work right away, but many pursue further technical training, certifications, or a two- or four-year degree. Graduation rates for students in CTE programs is 93 percent; the average for all students is 80 percent. More than 75 percent of CTE students pursue higher education or training shortly after high school. About 30 percent earn college credit and/or an industry certification while they’re in the program. Program designs vary, but students might spend two afternoons each week in a training class, and three afternoons a week in a real work setting, learning technical and employability skills in the career field of their choice. Students typically have a mentor or supervisor on site to guide their skill development. Frequently, CTE programs find corporate business partners that provide projects, equipment, and supervision for the hands-on component of CTE. Projects could include volunteer service, internships, job shadowing, presentations, or creating an event. There might be guest instructors from professional fields, and tours or site visits to a variety of work settings. In addition to developing technical and employability skills, students gain knowledge that helps to determine their future career preference or direction. A few programs even own their own fleet of aircraft and offer a pilot training program approved by the Federal Aviation Administration. Learn more about the CTE programs in your state, or about the career and technical education cluster system. To explore careers in each of the 16 career clusters, check out CareerOneStop’s Occupation Profiles or Career Videos. You can also find information on professional certifications for a wide variety of occupations, and research your local training resources. The Association for Career and Technical Education is the largest national education association dedicated to the advancement of CTE programs. CareerOneStop will attend their annual conference, CareerTech VISION 2017, December 6-9 in Nashville, TN. If you’ll be at the conference, please stop by our booth #143 for a visit.